Possum Trot Golf Course is conveniently located in the heart of North Myrtle Beach on Hwy. 17 and would be the perfect Myrtle Beach golf course to include in your Myrtle Beach Golf Authority Golf Package. It is one of the ten oldest courses on the Grand Strand and is known as “The Friendliest Course on the Strand”. Possum Trot is a traditional layout that features generous fairways surrounded by towering pines. 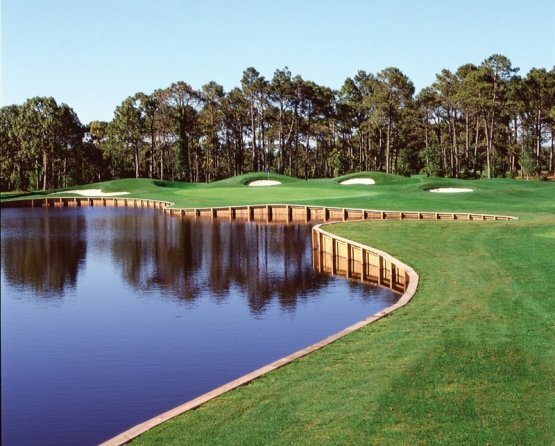 The course is designed to give all skill levels of golfers a challenging, but fun Myrtle Beach golf experience. The rolling terrain, strategically placed bunkers, water hazards and undulating greens are fun for everyone. Each hole has its own name such as “Little Possum”, “Big Possum” and “Oh No”. Possum Trot Golf Course is the perfect place to take a Myrtle Beach golf lesson as it has one of the top practice facilities on the Grand Strand. Renowned Myrtle Beach golf instructor, Hugh Royer III, will help to get your game in shape with a Myrtle Beach golf lesson. Hugh can help golfers of all skill levels, from beginners to experts. After your round at Possum Trot be sure to take in some of the outstanding North Myrtle Beach entertainment venues such as Duck’s Beach Club, Fat Harold’s Beach Club and OD Arcade and Lounge. If Myrtle Beach shopping is your thing, check out some of the specialty stores at Barefoot Landing. Myrtle Beach Golf Authority golf packages offer the very best in Myrtle Beach golf deals. It is time to book your Myrtle Beach golf package today! It is a good course with a great staff. It is not a top 15 at the beach but in the top 40 and was in good shape when we played. Our Group played the Glen's Package this year, they put this course in with it. We didn't know what to expect, but we're pleasantly surprised with this course. Friendly Staff, the course was in good shape. I would play it again.